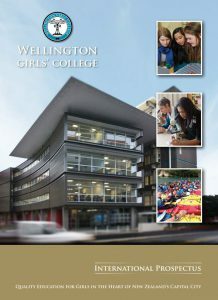 Wellington Girls’ College enrols international students from Years 10 – 13 from all over the world, primarily from Asia and Europe. Our classroom programmes are suited to English language learning and academic achievement. 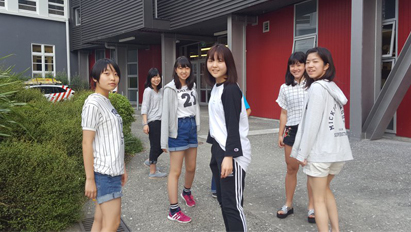 Our school and extra-curricular programmes are well suited to experiencing NZ lifestyle and culture. We offer English langauge classes at all levels including academic English preparation for tertiary study. English language classes are small and students have one or two English language lessons each day, as required. Our teachers are trained and qualified English language and English curriculum teachers. Language support is also available for other subjects and peer tutoring (Year 13 student support) is offered in Mathematics, Science and Commerce. Many students come to WGC to achieve a University Entrance qualification for NZ or overseas universities. To achieve University Entrance, students must allow a minimum of two years and preferably three years study at Year 11, 12 and 13, starting in February of Year 11. Students from Germany can achieve University Entrance in 18 months, July to the following December. German students should check the entry requirements for their preferred university. Students study towards the National Certificate of Educational Achievement (NCEA) and our results are consistently amongst the highest state school results in NZ. In 2016, 95% of WGC students achieved Level 1, 97% achieved Level 2, 98% achieved Level 3 NCEA. Students wanting entry to Year 12 and aiming for University Entrance, should have a minimum of 5.5 IELTS. University Entrance students will only be accepted directly into Year 13 with IELTS of 6.5. Students will sit an English language assessment on arrival at school to ascertain how much language support is required and to assist with subject selection. Students may also be asked to sit a Mathematics test to determine the appropriate level of study. Students study a different number of subjects at each year level. Students in Year 9 take 9 subjects, Year 10 take eight subjects, in Years 11 and 12 students take six subjects and Year 13 students study five subjects. Terms 1, 2 and 3 are approximately 10 weeks of lessons with two weeks holiday between terms. National NCEA examinations for Years 11,12 and 13 commence early November in term 4, students can return home after exams.